After listening to student feedback through a variety of channels, including in-person and online surveys, Drexel University’s Campus Dining Services has enhanced the university dining program for the 2018-19 academic year to maximize its offerings while simultaneously improving convenience for students. A wide array of changes have already been executed within Drexel’s Urban Eatery, the Northside Dining Terrace and the Handschumacher Dining Center, and newly refined meal plan options have also rolled out. “We’re always looking for improvements,” Kristina Coble, the general manager of Aramark said, noting that Aramark has been consistently receptive to student feedback since it took over as the university’s designated food provider in 2016. One of the biggest requests Aramark has heard from students has involved increasing options for vegans and vegetarians across the dining portfolio, according to Assistant Vice President of Campus Services Don Liberati. An increased variety of meatless proteins have crept into all platforms of Urban Eatery — exemplified by the new Beyond Burger at Ignite and the Chobani creations option at Downtown Grounds — and there is also now a designated section that exclusively offers vegetarian and vegan options. U.C. Veg — which replaced the former deli — is a manifestation of the growing interest in plant-based nutrition on campus. With options like roasted butternut tartines, roasted chickpea gyros, roasted stuffed turk’y, vegetarian crab cakes, vegan Caesar salad wraps and chocolate zucchini cupcakes, the menu is seasonal and ever-changing since it sources only local products. In addition to expanding their meat-free options, Liberati said that the desire for more fruits and vegetables was another key theme commonly voiced by students. 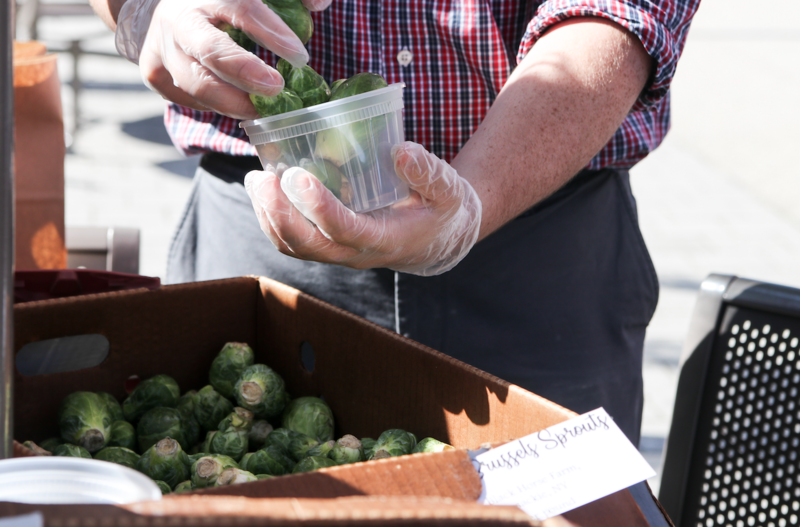 In response, they now offer a new program called Farm Share, which is essentially a farmer’s market that will occur every other Wednesday from 1:30 – 3:30 p.m. on the Race Street Lawn. Students can use their meal swipes, cash, dining dollars or dragon dollars to purchase local fruits and vegetables, and Aramark’s on‐campus dietician, Kellsey O’Donnell, also provides corresponding recipes. The Farm Share program will be running through November, though O’Donnell said that they are considering choosing an indoor location to continue efforts into the winter since it has been well-received by students so far. “It feels better when you’re eating fresh and local,” she said, explaining that the entire enhanced portfolio will be showcasing fresher ingredients. Coble said that the portfolio also focuses on offering a wider range of options so that students can experience more variety. That is the premise of Street Fare in Urban Eatery, a weekly rotating restaurant concept that features an extensive selection of cuisines to broaden options. While this section itself is not new, there will be two new restaurants this fall including the Latin-inspired “Mi Comida” and “Ever Grains”, a salad‐bowl concept. “It’s a monotony breaker,” Coble said. Northside has also seen changes in its menus that contribute to the team’s goal to diversify options. Chick-fil-A received a full renovation that included a menu expansion, which now offers grilled nuggets, grilled chicken cool wraps, side salads, spicy chicken sandwiches and chocolate chip cookies. The neighboring Sushi & Hot Bowls station also expanded its menu to offer hot rice bowls and yakisoba noodle bowls. “It’s become much more of a lunch destination,” Amanda Noll, the director of brand engagement and marketing, said. The Hans has also seen minor changes in its menu, she said, but the most significant change is that it is now open on weekends from 9 a.m. to 2 p.m., offering a special brunch menu. Noll said the new hours illustrate how they are working on increasing convenience for students. The newly improved meal plan options are yet another representation of the team’s dedication to improve accommodations. Not only are there no longer any time restrictions regarding the meal swiping system, but there is also a new meal plan option, the Hans All Access Dining Plan, which gives students unlimited access to the Hans in addition to 20 meals per week to use at Urban Eatery, as well as dining dollars. Alternatively, there is also a plan that includes 14 swipes per week with additional dining dollars, she said, and it’s up to the student to decide which plan better suits their individual needs. Students will also begin to have more seamless ordering experiences as the team works to implement more technology throughout the portfolio, according to Coble. Several sections of Urban Eatery, including U.C. Veg and Ignite, now have ordering kiosks where students can place their orders for added convenience and accuracy, and Liberati said they will continue to invest in further technology within their dining portfolios. Liberati said this change, as well as the others, will be continuously monitored and adapted as the dining services team consistently makes modifications to escalate the dining experience for all students. “We’re always adjusting based on feedback,” he said, noting that there are many more changes to come. Noll added that they are also always looking for new additions. At the moment, she said they are currently working on adding acai bowls to the offerings, which will likely roll out in the sushi bar during the spring term. She said they are exploring various other options like adding kombucha and hot entrees to the vegetarian section, although these ideas have not yet been finalized. “We’re really proud of what we’ve done, but we have a swirling list of things to still do,” Liberati said.